As the nation celebrates Labor Day, there is good news and bad news for unions. In August 2011, a time when there were fears of a new economic downturn and widespread dissatisfaction with national conditions, favorable ratings for labor unions among the public hit an all-time low of 41%. A more recent Pew Research Center survey, conducted in June, found a turnaround in those numbers, with 51% of the public having a favorable opinion of unions. Democrats had the most positive opinion of unions in this year’s survey: 80% of liberals and 70% of moderate-to-conservative Democrats had favorable views, with both groups registering double-digit increases since 2011. Republicans’ opinions of unions are much more negative. In the most recent poll, just 23% of conservative Republicans had a favorable view, a number almost the same as it had been two years earlier. Among liberal-to-moderate Republicans, a smaller segment of the party, 44% viewed unions favorably, a 10-point increase since 2011. 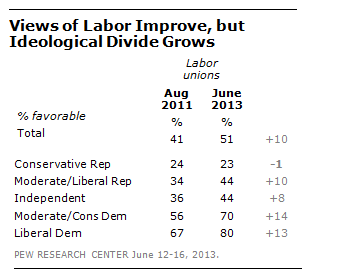 While public opinion about labor unions may have improved, the news about membership has not. The U.S. Bureau of Labor Statistics reported earlier this year that overall union membership in 2012 declined to 11.3% of the workforce, from 11.8% in 2011 to 11.3%. The falloff in union membership has been continuous since 1983, the first year for which the BLS says there is comparable data. In that year, the union share of wage and salary workers was 20.1%. 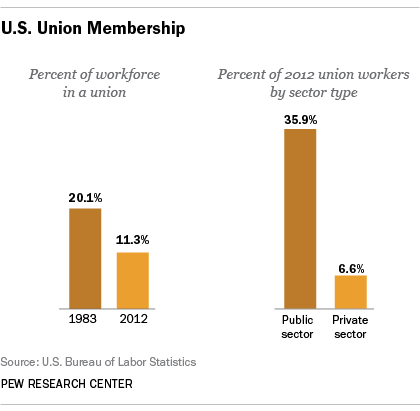 The number of union workers is bolstered by membership of public-sector workers. Their membership rate was 35.9%, five times higher than the share of workers in the private sector (6.6%). But public sector unions are facing their own challenges, ranging from widespread layoffs by state and local governments due to austerity measures forced upon them by the economy, to measures passed in some states, such as Michigan and Wisconsin, cutting back the power of unions representing state workers.